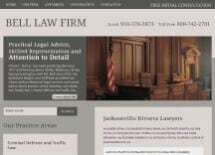 Bell Law Firm was established at its current location in Jacksonville, North Carolina in 1994. Since that time, the dedicated attorneys and staff of the firm have provided professional and effective legal services to the residents, military members and military dependents of Jacksonville, Onslow County, Camp Lejeune and New River Air Station. Our attorneys provide a broad range of legal services to individuals in the primary areas of residential real estate closings and wills. We pride ourselves on providing prompt and accurate legal advice to our clients and to maintain close, timely and open lines of communication with our clients. Our many return clients are a true testament to our dedication to our clients and the trust they place in Bell Law Firm.